The 2019 Lake Superior Angler is now complete, NOTE Membership includes a free magazine, we send it to you!. When: Saturday June 29, 2019. "Social Hour" starts @ 5:00 pm, dinner around 6. Bring your own refreshments. What: Planked trout, baked beans, salad and more.. There will be "fish talk"
This is a free event although donations will be accepted. Sad news, we lost a long time member and club supporter. Cedric was a master rod builder, and angler. He was a nice guy. Consider yourself very lucky if you own one of his lovely hand crafted rods. 1. DNR-Whether Kamloops and steelhead can spawn together and hybridize in the wild has been a question the Lake Superior Advisory Group has had for over 20 years. The results of the recent genetic testing confirms that not only is genetic introgression occurring, but it is widespread geographically, including other jurisdictions. How does your group feel about these findings? LSSA Response-Although the vast majority of introgression was limited to “near the source,” i.e. Lester, French, Sucker, etc., it was evident that there has been migration outside of that. The genetic sanctity of our naturalized North Shore steelhead is of utmost importance to the LSSA. The fact that introgression has been occurring, deeply concerns our organization. 2. DNR-Previous studies concluded the probability of Kamloops being produced in the wild was low. These recent findings confirm that “pure” Kamloops (offspring of two Kamloops parents) have been produced in the wild and they can survive to adult which are visually indistinguishable from steelhead. How does your group feel about these findings? LSSA Response-Although the likelihood of pure KAM is low, 2% found in scale sampling, the LSSA is deeply concerned with introgression and preserving the genetic identity of Knife River Steelhead strain. At this time, we have not reached a point of no return with genetic contamination and have time to stave off and hopefully cycle Kamloops genetics out of the gene pool. If wild Kamloops are showing up, no matter how few, they can exacerbate the genetics issue. 3. DNR-Given the options presented, which option does your group feel is the best and most responsible option moving forward? Why? Option #2: “Wait-and-See” – Cease Rainbow Trout stocking (Kamloops and steelhead fry stocking), evaluate natural reproduction and recruitment of steelhead, identify those streams whose runs have been primarily supported by steelhead fry stocking, reconsider steelhead harvest/stocking options during next management plan revision process starting in December 2024, or sooner if needed. Option #3: “Limited Wild Steelhead Harvest” – Cease Kamloops stocking, continue steelhead fry stocking, and open a limited harvest of wild steelhead (e.g., 1-over-28”, only certain rivers). d. Option #4: “Alternative Hatchery Product for Harvest” – Cease Kamloops and steelhead fry stocking; replace with a genetically-screened, adipose-clipped, pre-smolt steelhead stocked for harvest. LSSA Response- Although, none of the above options truly align with our desired method of management, the LSSA would choose Option #2, “Wait-and-See” out of the four presented. The DNR and stakeholders have put forth tremendous effort to rebound our naturalized steelhead fishery from what it was in the early 90’s to what it is today. We have seen some pretty incredible results due to those efforts. Our steelhead are still in the balance and opening any type of harvest at this time could set us back nearly thirty years in a matter of a couple. The genetic purity of North Shore steelhead is also of utmost concern which is why the LSSA feels the Kamloop program should cease. The LSSA does feel that our comments and recommendation for question #4 best represents all stakeholders while mitigating the genetics issue. 4. 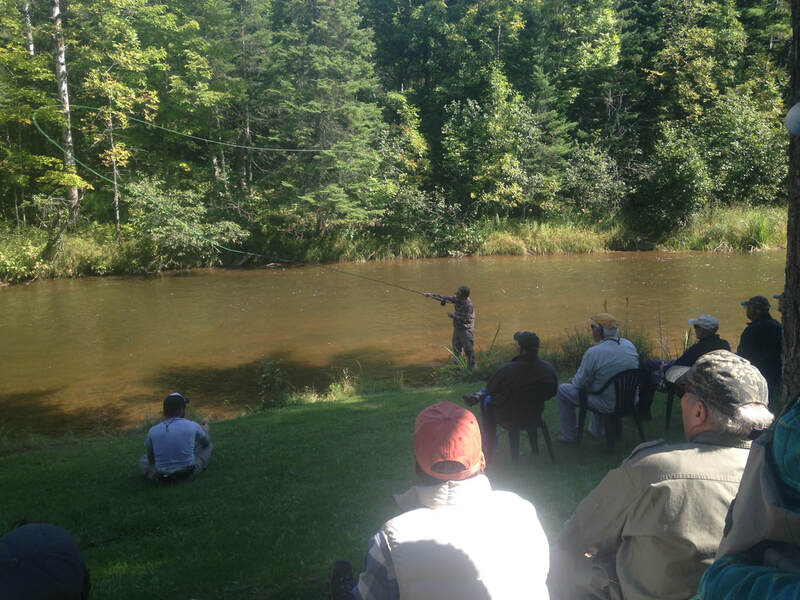 DNR-Are there other Rainbow Trout management options your group feels would be worth investigating? LSSA Response- Although rehabilitation of Steelhead is of utmost priority, the LSSA realizes other stakeholder concerns, i.e. a near shore fishery. That said, we recommend 50K Seeforellen and 50K Atlantics for stocking. We can evaluate which fairs better and pursue that option for long-term put and take. This provides a near shore fishery without the risk of introgression. Wisconsin is already stocking Seeforellen Browns which alleviates concerns regarding impact on other jurisdictions. Additionally, it would be likely to acquire from another jursdiction’s egg source or program. The key to success in this scenario is ensuring the fish are stocked at a larger size, 3.2 – 3.9 fish per pound. Stocking at this size produced a return rate exceeding 3% (Table 5, p. 22 Atlantic Salmon Management in the Minnesota Waters of Lake Superior) in the 1979-1980 year class of Atlantics. 5. DNR- Would your group like to share any additional questions, comments, or concerns? LSSA Response- Steelhead are an incredibly important fish for our region. They bring many anglers who prefer to catch them above all other species. They bring tourism dollars to Duluth and the rest of the North Shore. LSSA is mindful of the genetic impact due to the Kamloop program, which is why we suggest the trial program as listed above in question #4 be the management path moving forward. This will provide a near shore fishery to other invested stakeholders while maintaining the genetic sanctity of North Shore Steelhead as well as maintain focus on their continued rehabilitation. The LSSA would like to emphasize that the work on the Knife River 2nd falls was to facilitate steelhead passage past the falls which were in disrepair, not to make it easier for less fit species to pass. The work was to reinstate the falls to its original condition.